Is the writing below to small for you to read easily? Then click on font's to tell you how to enlarge the type size! 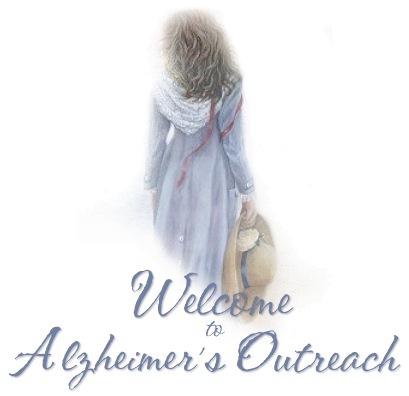 If you've been here once or twice, I know you'll be in a hurry to get where you want to go, so just click on any of the titles below to take you to the 'heart' of Alzheimer's Outreach. And if this is your first visit...then WELCOME! I'm so glad you're here! For some of you, I am sure that brings back vivid memories. That day when you too began this "odyssey into Alzheimer's". To be honest, it isn't easy. In fact, in some respects, it is probably THE most challenging disease ever known to man. You see, Alzheimer's is a master at deception. Especially in the earlier stages. There are very few who would recognize minor 'pauses' in conversations or slight lapses in memory, as 'signals' to this devastating disease. You see, my mother was my bestfriend. So it was like I lost her twice. As a daughter AND as a friend, I missed sharing what we had together. But most of all...I miss and missed my mothers touch. Like many of you, my mother was never alone in this disease. From the moment of diagnosis, she and I had been in this thing together. True, it may have separated us physically, but it never stopped the love I had for her because it is unconditional. I cherished what little she could give...and expected nothing more. We withstood the test of this disease...and came out the winners because we never let it defeat us. When she left this world on May 21st, 2000, I swore to continue this fight because that is what she would want me to do. Yes, she may be gone but her legacy will live on...and the living proof is this website.....I encourage you to read first hand our journey into Alzheimer's and the impact it had on both of us. In Mom and Me, you will see what it was like for us as we struggled with this disease. And in A Daughter's Love I offer my personal reflections on who I have become because of her. Please feel free to take what ever information you want from this place as long as it is NOT FOR PROFIT. Much of it I wish I WOULD have had all those years ago. And in exchange, I only ask two things of you. First, before you go, won't you take a moment and drop me an e-mail about what you thought of this place? All you have to do is hit the button below...it's connected to my e-mail. And secondly, I ask that you DO NOT take these beautiful midi's you are listening to. You see, they are a very special gift from my best friend and they belong HERE. I put them in so that you would find something beautiful in Alzheimer's...so please don't betray my trust. If I hear them in any other site, I will withdraw them...because you see, you won't be taking just some songs...you will be taking my best friend and a gift she made especially for me. I sincerely hope that you enjoy them, but when you go...leave her...and her songs behind...because you have no idea how very special they BOTH are to me. Oh...and one more thing. I know there are a lot of sites out there that offer help about Alzheimer's, so if you find "AO" useful, you might want to bookmark it, (or add it to favorites). Don't know how? Then click the word bookmark and it will tell you! Or, if you prefer, you can now print off our website addresses by clicking card. By the way, close to the bottom of the page, you will notice small underlined text. These are additonal places to journey through that are not listed on the above site map. It is my hope that you may find solace here within the pages of 'Babes Haven'. This site is dedicated in loving memory of my mother "Babe"
If you're looking for help for some dementia other than Alzheimer's, try our other site below! Special Thanks to Marilyn Sheaffer and my husband Tom. God Bless both of you for the love, guidance and patience you have shown me. Were it not for the both of you, this website would still be only a dream. I asked for the world ....and you gave it to me. To the best of my knowledge none of the graphics I have used are copyright, however if something is, please notify me and I will remove it immediately, or give credit to the creator, whichever you prefer. The information provided by Alzheimer's Outreach to this site, holds no responsibility for any of the documentation you may find here. While we try to keep the information as accurate as possible, we disclaim any implied warranty or representation about its accuracy, completeness, or appropriateness for a particular purpose. Thus, you understand and agree that Alzheimer's Outreach is neither responsible nor liable for any claim, loss, or damage resulting from its use. Nor should this information be used in the place of medical help. ALWAYS seek a physicians advice for ANY health matter! The mention of specific procedures, or services at this site does not constitute or imply a recommendation or endorsement by us.